On Monday night in a crowded room in Ohio University’s Walter Hall, nearly 70 people waited for a discussion to begin. Some sat quietly alone, others waved over friends and passed the wait in conversation. It was a typical enough environment for Ohio University, but one thing was notably different from the normal campus diversity statistics spread: the majority of people in the room were African American males. A handful of women—perhaps a dozen or so—dotted the crowd, as well as a few white faces. Everyone present, either as participator or observer, was there for the African American Male Initiative open forum. Assistant Professor of Political Science Debra Thompson called the buzzing room to order shortly after 7 p.m. She began with a brief explanation as to why the forum was created: the University’s Konneker Fund for Learning and Discovery had given a two-year grant to the AAMI Steering Committee to create an initiative specifically designed to improve the OU experience for African American men. She introduced the steering committee, comprised of faculty, staff, graduate students and undergraduate students, and explained the AAMI’s objective of providing academic, professional and personal support in order to boost OU’s graduation rates of African American males. Thompson then provided the forum with statistics. For every two African American males seen on campus, only one of them will graduate. 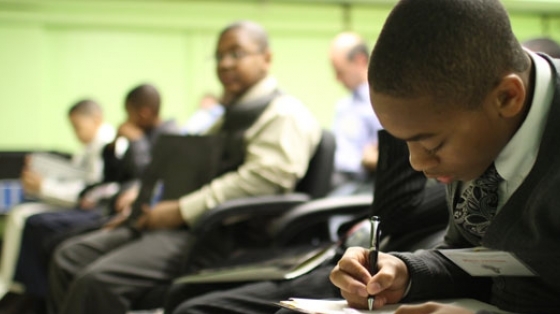 The national graduation rate of African American males is 11.2 percent. OU’s AAMI, she explained, is going to be designed by the students, for the students, in order to increase these rates not just at OU, but nationally as well. The AAMI is a movement occurring in dozens of American colleges. The University of Arkansas, St. Louis Community College, The Ohio State University, Alamo Colleges of Texas and University of North Georgia are just a few examples of learning institutions with the initiative in place. The two-hour forum began with some questions directed at the large group: What are some academic challenges faced by African American males at OU? What are some social issues for African American males at OU? What were individuals doing to address these challenges? The responses seemed unanimously agreed upon, both academically and socially. College readiness was a factor—a great deal of prerequisite knowledge intended to be learned before college is lacking in the public school system. One man spoke to the difficulty of being the only black kid in class and seeing very few black faculty members. Many others spoke of desiring a shared experience with people who simply look like them. One student’s response pertained to distinct racial lines. The student said that cultural division seems to exist between all of the cultures present at OU. He went on to explain how it’s difficult for African American individuals to feel welcome to partake in the larger campus experience, which leads them to mostly stay within the black community. There were a few individuals who spoke of rising above those difficulties. One man said to join all kinds of student organizations and take leadership positions in more than one of those groups. Attendees were then split into five small groups with about 15 people in each of them. There were five stations for the groups to rotate through: student involvement, mentorship, professional development, academic success and black masculinity. Some of the AAMI Steering Committee members led each section by asking the group questions and taking notes of the responses. Throughout the forum, the committee used student input to begin crafting a program best suited to meet the needs of African American males on campus. The room was practically buzzing with the excitement of the audience. There were many responses to the forum, as well as a few overarching attitudes. The men agreed that OU would benefit from some sort of mentorship program in which African American males could have peers to turn to when they need academic, professional or personal insight. As many of those men have come to OU without a support system in place on campus, Joe Stone, the associate director of undergraduate admissions, urged students to welcome new additions to the OU community and to create a homey environment that encourages confidence. A strong idea from the forum was that brotherhood, not competition, should be the motivation behind success. Jason White, assistant professor of exercise physiology, said that any sort of input anyone wanted to share was more than encouraged. “I dress up everyday to represent you all,” said White to the group. As the forum concluded, Thompson stressed the fact that the forum is a democracy. “This is our consultation with you, to whom we are accountable,” Thompson said. Thompson informed the group that the notes from the entire forum would be shared with those who attended. She also said that individuals were encouraged to respond with any edits in case anything that they had said was recorded inaccurately. The number of attendees at the AAMI far exceeded Thompson’s expectations, and the Steering Committee warned attendees that if they didn’t receive a greeting in passing, its members would call them out.